Wellsprings 20-1 is the same formula as Wellsprings Serenity with the addition of natural Oestrogens. No, you should use either Wellsprings Serenity or Wellsprings 20-1. Learn why the 6 day break is recommended for women that are no longer menstruating and what to do if symptoms return during that period. There can be several reasons for symptoms returning after a few months of using your Wellsprings Cream. This article discusses why this can occur and what you should do if it does. 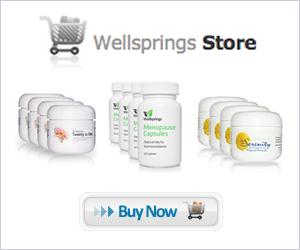 What is the source of the natural progesterone in Wellsprings creams? The natural progesterone that is the active ingredient in Wellsprings Creams is sourced from plant saponins. Here are a few pointers that our customers have reported helpful over the years. An eighth-teaspoon twice a day, mornings and bed-time for 24 days, discontinue for 6 days then repeat every month.